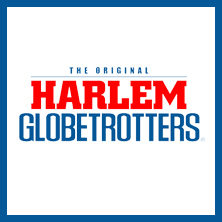 The Harlem Globetrotters are an exhibition basketball team that was formed in 1926 by Abe Saperstein in Chicago, Illinois. The ever changing team combine athletics, theatre and comedy to create a unique show that has entertained audiences worldwide for decades. Their various incarnations have played more than 20,000 exhibition games in 118 countries! To be the first to hear when more Harlem Globetrotters tickets go on sale you can sign up to the Eventim Ticket Alarm below.